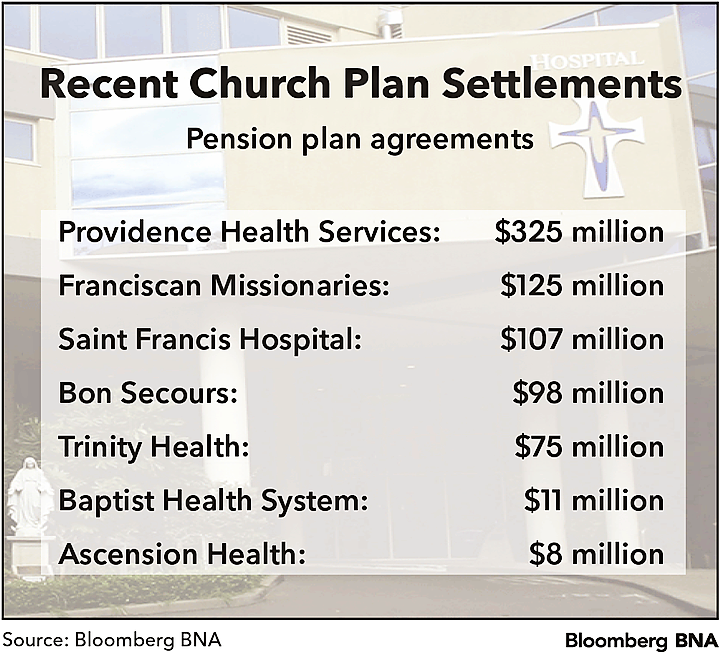 Religiously affiliated hospitals can run their pension plans as church plans exempt from federal funding requirements, the U.S. Supreme Court ruled ( Advocate Health Care Network v. Stapleton , U.S., Nos. 16-74; 16-86; 16-258, 6/5/17 ). The court’s unanimous ruling reverses the decisions of threefederalappeals courts, which found that church plans exempt from the Employee Retirement Income Security Act must be established by churches, not hospitals. The Supreme Court disagreed, saying that ERISA’s text imposes no such requirement. The cases have roots in a four-year flurry of litigation involving more than two dozen religiously affiliated hospitals throughout the country. In all, the lawsuits claim that more than 300,000 hospital workers face a pension shortfall of about $4 billion because hospitals—along with help from the Internal Revenue Service—have wrongly designated their pension plans as church plans exempt from ERISA’s funding rules. Several cases have led to multimillion-dollar settlements. Under this ruling, pension plans can qualify for ERISA’s religious exemption regardless of whether they’re established by a church or another organization. But that doesn’t mean the disputes over hospital workers’ pension benefits have been resolved, Theresa S. Gee, a member with Miller & Chevalier Chartered in Washington, told Bloomberg BNA. “This is a significant and hard-fought victory for the hospitals, but the dispute is far from over,” Gee, an employer-side ERISA attorney, said in an email. Lingering questions include whether the hospitals’ internal benefit committees qualify as “principal-purpose organizations” under the statute and whether specific hospital pension plans otherwise satisfy the statutory exemption’s requirements, Gee said. Resolving these questions could require a close look at the factual circumstances of a given hospital and its plan, Gee said. Indeed, Karen L. Handorf, a partner Cohen Milstein Sellers & Toll PLLC in Washington who filed many of the recent church plan lawsuits, said the litigation effort won’t end with this decision. The issue resolved by the Supreme Court is a significant one that will make it harder for the plaintiffs in these cases to move forward, Mark Chopko, partner with Stradley Ronon in Washington and chairman of the firm’s nonprofit and religious organizations group, told Bloomberg BNA in an email. “Although the Court indicates that there may be other issues to be resolved—such as the association of the hospitals with the Church—given the centrality of the construction of the statute to these disputes, we expect the decision will go a long way to resolve these cases entirely,” Chopko said. Chopko filed an amicus brief supporting the hospitals on behalf of the Catholic Health Association. He said the group was “very pleased” that the Supreme Court confirmed the “settled understanding of religious charities” and the long-held position of the relevant government agencies.In the months leading up to this decision by the Supreme Court, several hospitals have agreed to multimillion-dollar settlements, including Washington-based Providence Health & Services ($352M), Connecticut-based Saint Francis Hospital ($107M), Trinity Health Corp. ($75M), Ascension Health ($8M) and Alabama-based Baptist Health System Inc. ($11M). The June 5 decision by Justice Elena Kagan “exclusively focused” on statutory interpretation without delving into “economic or other consequences,” Edna S. Kersting, an employee benefits attorney and partner in Wilson Elser’s Chicago office, said. The disagreement centered on which entities are allowed to establish ERISA-exempt church plans. Both the hospitals and the workers agreed that ERISA’s text allows nonchurch entities to maintain exempt church plans, but the workers argued that such a plan must be established by a church—and not a hospital—to qualify for the exemption. The relevant statutory text says that an ERISA-exempt church plan is a plan “established and maintained” by a church. The law also says that a plan established and maintained by a church includes a plan “maintained by” a qualifying church-connected entity. Kagan called the statutory text “a mouthful, for lawyers and non-lawyers alike.” But in arguing for a narrower church plan exemption, the workers placed too much importance on the word “include,” Kagan said. “That use of the word ‘include’ is not literal—any more than when Congress says something like ‘a State ‘includes’ Puerto Rico and the District of Columbia,’” Kagan said. “In effect, Congress provided that the new phrase can stand in for the old one as follows: ‘The term ‘church plan’ means a plan established and maintained by a church [a plan maintained by a principal-purpose organization].’ The church-establishment condition thus drops out of the picture,” she wrote. This victory for the hospitals is also a victory for the Internal Revenue Service, which has for decades given its blessing to hospitals that treat their pension plans as ERISA-exempt church plans. The IRS defended its position in an amicus brief joined by other federal agencies, including the Department of Labor and the Pension Benefit Guaranty Corporation. The agencies argued that their interpretation was entitled to judicial deference—an argument that was rejected by the U.S. Courts of Appeals for the Third, Seventh, and Ninth Circuits. Although Kagan noted that the IRS’ position has been repeated in “hundreds” of rulings and opinion letters issued since the 1980s, she expressed no opinion as to whether this agency interpretation was owed deference by the federal courts. “The decision to exempt plans neither established nor maintained by a church could have the kind of broad effect that is usually thoroughly debated during the legislative process and thus recorded in the legislative record,” Sotomayor wrote. Under the court’s ruling, the hospital workers’ pension benefits may not be governed by ERISA’s protections, including the mandate that plans obtain government-backed pension insurance. ERISA also establishes a set of “minimum standards” for benefit plans, said Wilson Elser’s Kersting. Those rules dictate how plans must be funded, who must participate, how quickly benefits vest, and how participants can challenge adverse decisions, among other things, Kersting said. The Pension Rights Center, which has supported the hospital workers in multipleamicus briefs, reacted to the ruling by emphasizing the “devastating” effect a lack of federal pension insurance can have on retirees if their plans run out of money. The Supreme Court’s newest member, Justice Neil Gorsuch, didn’t participate in this decision. He was confirmed to the court on April 7, nearly two weeks after the case was argued. Lisa S. Blatt of Arnold & Porter LLP argued on behalf of the hospitals. James A. Feldman argued on behalf of the plan participants. Malcolm L. Stewart of the Department of Justice represented the government. Text of the decision is at http://www.bloomberglaw.com/public/document/Advocate_Health_Care_Network_v_Stapleton_No_1674_1686_and_16258_U?doc_id=XHR9GJRG000N.